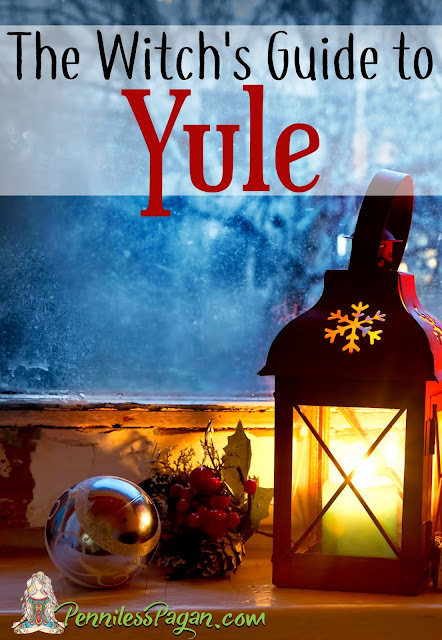 Between the holly jolly music and the endless sweets, Yule is a pretty awesome time of year! For me, it's a time to relax, restore, and most definitely indulge. I work hard in October and November to make sure I have a little extra time in December for reading novels, crocheting, and baking. You know, things 80-year-olds like to do. Just as nature hibernates in the cold dark months of winter, Yule (the Winter Solstice) is a time for restoration and reflection. It's the shortest day of the year, generally falling between the 20-22. As the days progress from here on out, light will extend by roughly a minute each day, showing us that even in our darkest hours there is hope for a new dawn. Representing the God, the sun is reborn during the solstice. Having proverbially died on Samhain, the God's death cycle has now ended and life is restored, which is why Yule is often called The Renewal. ...If you want to be extraordinarily technical, the sun (God) returns the day after the Winter Solstice, since the solstice itself is the shortest day of the year (with the days following gradually giving in to the returning sunlight). This is why some celebrations begin on the solstice and party hard into the wee hours of the following morning. With my time of all-nighters behind me, I (like most others) celebrate on the solstice itself. Surely our ancestors weren't rigid in their celebration schedule since they didn't have NASA doing the math for them. Plus this sabbat is a time of rest, so there's no need to overcomplicate the darn thing. In case you haven't noticed, I do my best to keep it simple. You'll notice in the dormant nature around you the Goddess (nature) is resting after giving birth to the God (Don't overthink the familial ties here. It's proverbial). Now is the time to regroup and revitalize as The Wheel slowly turns toward spring. If you're looking for foods to help celebrate the return of the sun, think hot and warm! Ginger, nutmeg, and cinnamon are all wonderful additions to baking this time of year, honoring the return of the sun. Red/green, gold/silver celebrate the God and Goddess respectively, which is why we so commonly see decorations in these joyful hues. Pine, cedar, and spruce are popular in Yuletide celebrations, representing the eternal nature of our souls. Need some altar inspiration? 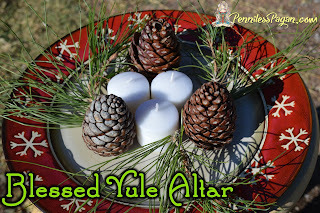 Check out my simple Yule altar that will brighten your home with the beauty of nature! 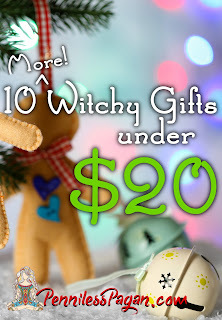 If you're in a giving mood but not in a get-trampled-for-a-good-sale kind of mood, I've got you covered! 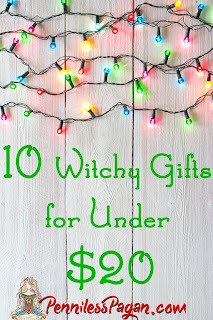 Here are 20 witchy gifts for under $20, all perused from the comfort of your couch! (which means pants are totally optional). 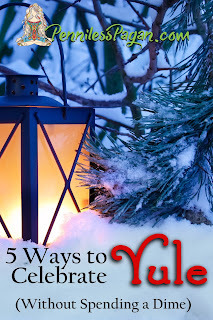 If your credit card is curled up in the corner, whimpering and shaking from being overworked, check out these posts on making Yuletide memorable without spending a dime! Above all, remember this isn't a season of stress and overspending but a time we should stop to regroup and replenish. Find peace in the cycles of nature and honor the seasons. Take a few extra moments to indulge in something restorative to the soul, such as meditation or yoga. Find healing in the stillness by disconnecting from electronics. Relish the moments with your family...even if those aren't so quiet. Winter, and Yule specifically, is a time to nourish our bodies and minds, because nothing in nature moves nonstop—not even with a peppermint macchiato! Wishing you a magical, restorative Yule and a New Year brimming with health and happiness! Do you take extra downtime during the Yuletide season? 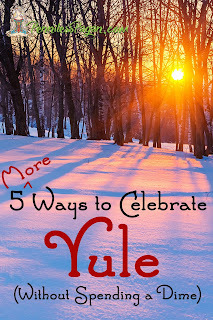 What's your favorite part of Yule? I have been reading your writings for a while. I think this is my most favorite thus far. Thank you for sharing your ideas and thoughts. Many blessings. That makes me happy to hear! =D Thank you for sharing your kind words, and I hope you have a fantastic Yule! I love this! How wonderful and magickal! It adds more to things I pick and pull from out of a Yule book by Dorothy Morrison. You gently remind us of what this season means. It's refreshing. I love the ideas you have for gifts and things to honor the season. My favorites are putting up my Yule tree and decorating it but quickly because I have too much stuff. I love getting a new ornament or two. I get a new ornament every year. I love opening gifts I give to myself (I'm single and it's just myself and my dogs. I try to collect little things beginning about August & set them aside & then put them under my tree the night before), I love that I finally decided to ask for work off so I'm home to enjoy everything (began back in 2013) and I love giving cards to a few close friends. My friends don't celebrate Yule but the act of sending cards is fun. Thank you so much for this! I need a new way to celebrate that doesn't drain me. This looks like it's just the ticket! I also enjoy reading and baking and I'm not 80 either, lol. I don't crochet but I do knit, and recently knitted a mistletoe heart which I hadn't done for a few years!